So how did it look? This article is a follow on to the article An MFC extension library to enable DLL plug-in technology for your application using MESSAGE_MAPs. If you are not familiar with the library itself I would recommend that you look at the main article first. Once again I will review how I went about designing the plug-in and implementing its features. Along the way I will also cover problems encountered and how they were solved. When I look at the plug-ins I can write, it seems to me that I will be able to take most of my existing article series and convert each as I go. It has been a good starting point for upgrading this library. If users of the class wish to see a specific plug-in created, they should visit my blog page and post a suggesstion there. MFC extension library - A plugin to handle owner drawn menus - A plug-in article which adds owner drawn menu support. As a starting point, I created an MFC extension DLL as described in the main article. From there I got hold of the source from my Multi Page Print Preview enhancements for MFC Doc/View applications article and started combining the two into a working project. I added a message map entry to process the existing ID_FILE_PRINT_PREVIEW message. With the V1.2 upgrade to the library, I was able to return true for all CView derived classes so that we can replace their existing print preview functionality. For the Pre call for the message we suppress the standard implementation of it using SuppressThisMessage(), as we do not want multiple preview windows being displayed. // replace the default print preview with ours! // Be sure to Unhook Frame Window close if hooked. // pState structure will be/has been deleted. // must be done here. Well, once I had this and the standard code from the enhanced print preview code merged sufficiently to get this far, I ran some tests to see how well it worked. Now during the print preview initialisation, this standard dialog bar is being destroyed and replaced with our own, which enabled the mouse wheel messages, so why is it being shown? This was the first clue to my problem. It seems that even though I was trying to suppress the ID_FILE_PRINT_PREVIEW message in the standard MFC code, I was failing to, and two preview views were being created, mine and MFCs. This was the main source of the problem. So how do I fix it? In the MFC extension library that handles the plug-ins, each plug-in had a bool m_bSuppressThisMessage variable which when we needed to suppress the message was being set to true, so I checked the state of the flag in the ProcessCommandMessageMaps() function after my plug-in message had just been processed. After some thought it occurred to me that when we create the preview view and we go about displaying it, other messages may be being processed by the library in the background, probably due to a message pump being done due to a SendMessage() call, and as we only have a single flag for all passes through the library, any additional messages that do get processed before we return from our plug-in function will reset the suppressed message flag. This is not what we want to happen. Now that we have identified the flaw in the library we need to fix it. Well this also made me think about a problem that was originally experienced by early users of the plug-in library, that is that when WM_NCDESTROY messages were processed, some objects called delete this on themselves, causing Post message handler to fail with a GPF when trying to access the deleted map objects. I did not want to re-introduce the same problem, so had to also change the ProcessCommandMessageMaps() and ProcessWindowMessageMaps() functions to check the CPIState object related to the plug-in object. Once all this had been done, I rebuilt the project and the problem had been fixed. This new version of the plug-in library is now V1.3 - It seems every time I create a new plug-in, I discover another flaw in it. Hopefully there will be less and less of these in the future. 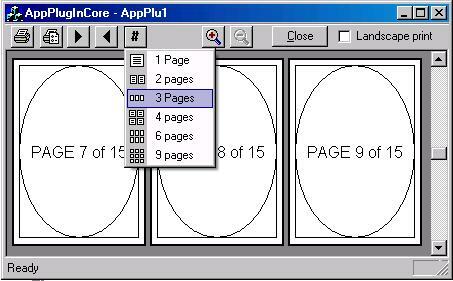 This made the preview view plug-in enabled, so it makes use of the owner-drawn menu plug-in for the popup menu used to select how many pages the user wishes to preview at a time. A toolbar resource, which is loaded by the owner-drawn menu plug-in was added with the correct images. I Now needed to enable the printer selection and the paper orientation features. In the original aritcle, I had a class which enumerates all the printers installed on the local system. Along with this class, the user had to add some functions to their CWinApp derived class to allow the page orientation and the printer to be changed. But we cannot do this in our plug-in. We have to find a different method of doing this because we cannot modify the CWinApp or CPlugInApp derived classes. In this version we had to call the relevant function of the CWinApp derived class as we needed access to the CWinApp::m_hDevMode global handle, which manages the currently selected printer. We need to find a different way of doing this. So we can hook up the paper orientation, but how do we switch printers? Well again we need to avoid using functions added to the CWinApp derived class so we need to make use of existing MFC code. The most obvious of which was CWinApp::SelectPrinter(), but after playing with this for a while, I could still only get GPFs! So, following his advice, I removed the printer combo box, and added a print setup button and mapped the relevant code. And hey presto, it works without any problems.